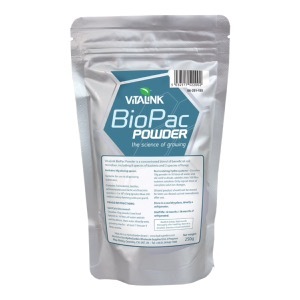 Vita-link BioPac Powder is exactly that, a powder that is dissolved into the nutrient solution to introduce beneficial bacteria into the root zone. Containing 8 species of bacteria, 2 species of fungi, along with Trichoderma, Bacillus, Actinomycetes and Lactic Acid, BioPac Powder has greater than 300 million colonies in just 1 gram. By dissolving 10grams of Vitalink BioPac Powder into the nutrient solution will introduce beneficial microbes to the plants roots. These microbes help break down any unwanted organic material, like dead roots, along with dissolving any available phosphorus, and turning them into usable food. BioPac Powder also helps absorb nitrogen from the air making this important element more readily available to the plant. Introducing these beneficial microbes to the plants help improve the overall health of the plant and roots, along with increasing the plants defences to stress. Dissolve 10g/1 level spoon into 10L of water, stir well and make sure the power is fully dissolved before use. Once diluted the solution should be used straight away, do not mix and store for prolonged periods of time for use at a later date.